Sweatshirts Grape Jordan 5. Jordan 5 Grape sweatshirt designed to match Jordan sneaker outfit. Sweatshirts Grape Jordan 5. Grape Jordan 5 match Sweatshirts. Air Jordan 5 Grape. Sweatshirt designed to match. Air Jordan 5 Grape sneaker colorway. View the entire matching collection of Jordan 5 Grape. Jordan release date Sept 25, 2018. 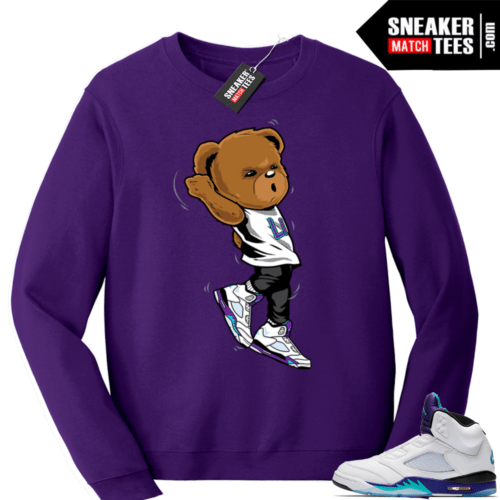 The Shooting Bear sweatshirt was designed to go with your sneakers. This design is exclusive to Sneaker Match Tees Online shop. Complete your Sneaker outfit with this exclusive design.